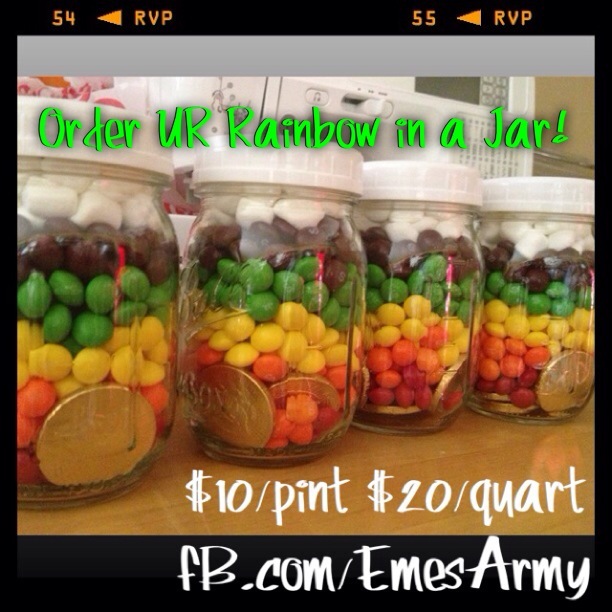 Eme’s Rainbow Jars are now available for shipment! They make fantastic gifts for teachers & co-workers!! Eme can’t see a rainbow. She’s never seen one. We’ve tried over and over. It’s difficult for everyone involved that we can’t share the simple wonder of a rainbow with her. Her sisters & brother always try to help her find it in the sky when they magically appear. Mom & dad try to get the absolute best viewing angle…shooting to the side of the road or easing down driveways when a magical rainbow is spotted. They’ve chased the rainbow for 6 years now. A few years back, mom found this craft on Pinterest (of all places, right?) and she showed it to the kids. Immediately, they discussed how they should make it so Eme see each color up close by laying each color of Skittle on a contrasting color like a white or black piece of paper. (She still has a little bit of her central vision – about 5% of what most people have.) Mom thought Eme could better understand how a rainbow has layered blended colors if she could stack & blend the colors herself. The family is accustomed to thinking out of the box to share their sighted world with Eme, their blind little sister. Her sisters immediately said, “Eme can taste the rainbow!” And brother added that she could eat a cloud and find some gold too. Each Rainbow Jar of Skittles is topped with a marshmallow cloud & ends with golden wrapped chocolate coins. Then, with big eyes to go with their big hearts, her sisters asked if they could make the Rainbow Jars and sell them to raise money for developing a gene therapy treatment for Eme & other LCA kids. Eme was born with a very rare genetic mutation that is causing her to go blind from a condition called LCA, Lebers Congenital Amaurosis. Eme is thought to be 1 of 300 in the US with her disease causing CRB1 mutation. Right now, a gene therapy treatment is her best hope. A treatment in development can save her sight and potentially restore her vision. But, her family is working against time. If too many of Eme’s retinal cells die from her CRB1 mutation, the treatment will not work. Her family has organized Eme’s supporters into EmesArmy | fighting childhood blindness and they actively raise money to fund LCA Research to stop Eme’s blinding LCA. Eme’s sisters make Rainbow Jars and sell them for $10/pint & $20/quart. Their brother makes all their flyers and order forms. Orders yours today! 319 – my daughter´s birthday!